Apple has finally taken the wraps off of its latest iPhone refresh, introducing the world to the iPhone 6S and iPhone 6S Plus. While the phones may look the same as last year's models on the outside, they're packing some serious upgrades inside. Perhaps the biggest new feature to grace the iPhone is the addition of 3D Touch. An evolution of the Force Touch feature that made its first appearance on the Apple Watch when it debuted a year ago, 3D Touch brings a new way to interact with your iPhone. With pressure-sensitive actions giving access to new menu options, 3D Touch could impact your workflow for the better. Let's take a look at what 3D Touch is and what it brings to the table for power users to stay productive. We've already seen the makings of 3D Touch with Force Touch on the Apple Watch, which may have been a testbed for an expansion to the bigger screen. However, the pressure-sensitive touch paradigm operates a little differently on the iPhone than it does on Apple's wearable. The larger screen real estate of the iPhone 6S makes the experience interactive. The highlight of 3D Touch is what Apple dubs Peek and Pop. As silly as it sounds, it's an accurate description of the interactions enabled by firm presses. Essentially, you press a little firmer than normal on a screen element to get a peek at what lies inside, and then you press more firmly to pop the windows into full view. The feature is similar to previewing files and images on a MacBook when you hover your cursor over the file or icon. 3D Touch also enables Quick Actions when used with app icons. For example, if you firm press on an app's icon, a contextual menu pops up, giving you quick access to a number of shortcuts. For instance, long pressing on the Camera icon will give you options to quickly launch the FaceTime camera for selfies, take a video or capture a photo with the rear iSight camera. This is similar to right-clicking on a desktop to bring up contextual menu options. And because 3D Touch constantly monitors the amount of pressure applied to the screen, you can use this feature for doodling and drawing. Artists can take advantage of the pressure sensitivity to draw thick and fine strokes, and note-takers can benefit with finer handwriting. Along with all of this, you'll get tactile feedback from the iPhone itself for each action you take that involves pressing on your screen. Essentially, you'll know right away that your presses are being registered with a quick vibration, much like the Apple Watch's taptic engine. Thanks to several leaks leading up to the launch of the iPhone 6S and 6S Plus, we knew that 3D Touch was coming to Apple's latest smartphones in some form, but it wasn't quite clear how Apple would implement the feature. However, now that the cat is out of the bag, we know that Apple has put quite a bit of thought into 3D Touch integration. For business users looking to up their productivity game in particular, 3D Touch could increase the speed with which you deal with the constant barrage of emails, texts and phone calls. The Mail app is a particularly interesting case, offering up some cool, unique interactions. 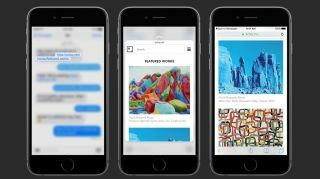 If you pick up and iPhone 6S or 6S Plus, you'll theoretically be able to more efficiently tackle your inbox with Peek and Pop. Press firmly on a message, and an overlay will come up over your inbox showing a preview of the email's contents. If you decide to tackle the email right at that moment, you press harder to jump into the email itself and type up a response. The Peek and Pop feature works similarly across a number of other apps, allowing you to preview a map location or website by pressing on an address or URL, respectively. While you're peeking, you can also use a variety of swipe gestures to access commonly used actions in each app. It may seem like a small feature, and we won't know how effective this feature is until we can get our hands on the new iPhones, but Peek and Pop looks like it can help shave off a few precious seconds each time you pick up your phone, at the very least. In the same vein, Quick Actions seem like another useful way to cut down on time spent fiddling with your phone. For example, pressing on the Messages icon will open up quick access to your favorite contacts, while pressing the Maps icon will present you with quicker access to getting directions, sending your location to a friend or coworker, and more. You no longer have to jump in and out of apps, and it's a useful way to multitask on a small screen. These are just a few of the examples from Apple's built-in apps, but the true test of 3D Touch's usefulness will lie in how third-party developers leverage the feature. If adoption is widespread – and there's no reason to doubt it won't be – we're sure to see some creative uses for the feature. For example, imagine being able to light press in your favorite writing app to highlight a particular sentence and then firmly press to highlight the whole paragraph. It's definitely a minor thing, but with interactions like this peppered throughout all of your iPhone apps, the time saved could add up. Current page: What is 3D Touch? Next Page Should you upgrade?